" Streep's performance is so true and so uncannily accurate, so full and so complete in its understanding, that she is fascinating every second she is onscreen "
" Although this film contains a great performance by Streep (one of the greatest actors of her generation) and strong supporting performances, the muddled multi-flashback story spends far too much time on Thatcher's late life mental problems. " 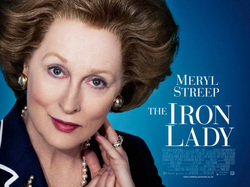 While I was watching the movie,I was skeptic wether the old woman in the movie is really Meryl Streep.I want to believe that it's another cast since they ahve portrayed a young Thatcher,a happily married adult Thatcher serving as the Prime Minister and finally and old Thatcher suffering from dementia. Her make up was really impressive.The way they made her so old and the way how she carried herself .At first,i was like did she grew old like this now because the last time I watch her on the movie " the devil wears prada" she's not that old.it was really superb! Another outstanding performance from Mery Streep.No wonder,she was always loved by British film makers to do a British movie because she can speak or imitate their accent perfectly.It was said that Streep can speak french and imitate other accents perfectly such as Australian,NZ and UK accents.She's American by birth and language but when she puts herself in movies,you can be easily convinced that she's not an American.it's not only her accent but it is her acting that is ridiculously good.She rarely do movies in a consecutive years but everytime she does a movie,it is always bombarded with awards and nominations.I bet she chooses carefully which movie she's going to be part off.She as she has a legacy and a name to take care. As for this movie,I don't personally knew the story of Margaret Thatcher as I didn't learn it in my history class.It was just now that I heard of a powerful woman who actually became the first prime minister woman in British goverment.She was indeed a strong woman because amidst the protest,she was able to lead the country for 11 and half years before she resigned. I was actually encouraged of her life.I mean despite the conservativeness of the country during her time,she still ahd all the strength to put her food forward.To challenge all the gentleman.She gave orders as tough as a man but she have the heart of a woman.After all,she's a mother and a wife.And I admire the relationship she had with her husband because I can imagine it must be so hard and challenging their daily lives were but they stayed together till old age and that was beautiful. I look up to her as a one of those powerful and influential woman I look up to aside from our previous President Gloria Macapagal Arroyo.it just means,gone are the days when the role of the woman in our society are just plain housewives.There's nothing wrong in that but given the equal opportunity I think it is necessary to put balance in this world.I can imagine without women working in goverment departments or in schools or in political positions.I bet its so boring considering the global situation we have now.We need balance.Men needs to be challenged.Men need to be pushed to their limmit.
" "People don't think anymore," she says. "They feel." "Watch your thoughts for they become words," she says. "Watch your words for they become actions. Watch your actions for they become habits. Watch your habits, for they become your character. And watch your character, for it becomes your destiny. What we think we become"
"When Denis asks Margaret to marry him, she says yes—under one condition: She will not be someone who will stand in the background; she'll not die washing teacups. "One's life must matter, Denis," she tells him. "Beyond all the cooking and the cleaning and the children, one's life must mean something!" Upon taking office, Margaret paraphrases a prayer from Saint Francis of Assisi: "Where there is discord, may we bring harmony; where there is error, may we bring truth; where there is doubt, may we bring faith; and where there is despair, may we bring hope." Plot The film begins circa 2008 (opening against the backdrop of news of the Islamabad Marriott Hotel bombing) with an elderly Lady Thatcher buying milk unrecognized by other customers and walking back from the shop alone. Over the course of three days we see her struggle with dementia and with the lack of power that comes with old age, while looking back on defining moments of her personal and professional life, on which she reminisces with her (now dead) husband, Denis Thatcher. She is shown as having difficulty distinguishing between the past and present. A theme throughout the film is the personal price which Thatcher has paid for power. Denis is portrayed as somewhat ambivalent about his wife's rise to power, her son Mark lives in South Africa and is shown as having little contact with his mother, and it is implied that Thatcher's relationship with her daughter Carol is at times strained. In flashback we are shown Thatcher's youth, working in the family grocery store in Grantham, listening to the political speeches of her father, whom she idolised - it is hinted that she had a poor relationship with her mother - and announcing that she has won a place at the University of Oxford. She remembers her struggle, as a young lower-middle class woman, to break into a snobbish male-dominated Tory party and find a seat in the House of Commons, along with businessman Denis Thatcher's marriage proposal to her. Her struggles to fit in as a "Lady Member" of the House, and as Education Secretary in Edward Heath's cabinet are also shown, as are her friendship with Airey Neave (later assassinated by the Irish National Liberation Army), her decision to stand for Leader of the Conservative Party, and her voice coaching and image change. Further flashbacks examine historical events during her time as Prime Minister of the United Kingdom including the rising unemployment related to her monetarist policies and the tight 1981 budget (over the misgivings of "wet" members of her Cabinet – Ian Gilmour, Francis Pym, Michael Heseltine and Jim Prior), the Brixton Riots of 1981, the miners' strike of 1984–5, and the bombing of the Grand Hotel during the 1984 Conservative Party Conference, when she and Denis were almost killed. We also see (slightly out of chronological sequence) her decision to retake the Falkland Islands following their invasion in 1982, the sinking of the ARA General Belgrano and Britain's subsequent victory in the Falklands War, her friendship with Ronald Reagan and emergence as a world figure, and the economic boom of the late 1980s. By 1990 Thatcher is shown as an imperious but aging figure, ranting aggressively at her Cabinet, refusing to accept that the Community Charge (the "Poll Tax") is regarded as unjust, and fiercely opposed to European Integration. Her deputy Geoffrey Howe resigns after being humiliated by her in a Cabinet meeting, Michael Heseltine challenges her for the party leadership and her loss of support from her Cabinet colleagues leaves her little choice but to resign as Prime Minister, about which she is shown as still angry and bitter twenty years later. Eventually, Margaret is shown packing up her late husband's belongings, and telling him it's time for him to go. Denis's ghost leaves her – in spite of her cries that she is not yet ready to lose him – fully dressed but without his shoes, and she is left alone washing up a teacup. Doubt can be a bond as powerful and sustaining as certainty. When you are lost, you are not alone. 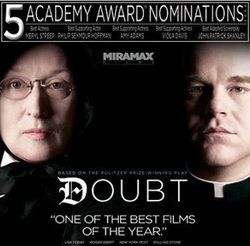 Set in 1964 at a Catholic church in the Bronx, New York, the film opens with the progressive-minded Father Flynn (Philip Seymour Hoffman) giving a sermon on the nature of doubt, noting that, like faith, it can be a unifying force. The next evening, Sister Aloysius (Meryl Streep), the strict and conservative principal of the attached school, discusses the sermon with her fellow nuns, the Sisters of Charity of New York. She asks if anyone has observed unusual behavior that would inspire Father Flynn to preach about doubt, and instructs them to keep their eyes open should any such behavior occur in future. Sister James (Amy Adams), a young and naïve teacher, observes the closeness between Father Flynn and Donald Miller, the school's only black student and an altar boy. One day during class, Sister James receives a call asking for Donald Miller to meet Father Flynn in the rectory. When he returns, Donald is distraught and Sister James notices the smell of alcohol on his breath. Later, while her students are learning a dance in the gymnasium, she sees Father Flynn placing a white shirt in Donald's locker. Sister James reports her observations to Sister Aloysius. Under the pretext of discussing the school's upcoming Christmas pageant, Sisters Aloysius and (to a lesser extent) James voice their suspicions that Father Flynn's relationship with Donald may be inappropriate. Several times Father Flynn asks them to leave the matter alone as a private issue between the boy and himself, but Sister Aloysius persists. Finally, he is pressured into admitting that Donald had been caught drinking altar wine, and he had promised Donald not to tell anyone about the incident. Having now been forced to break that promise and reveal the truth, he will need to dismiss Donald as an altar boy, which he had been trying to avoid. Before leaving, Father Flynn tells Sister Aloysius he is displeased with her handling of the situation. His next sermon regards gossip and how it is easily spread. Initially, Sister James is relieved and convinced of Father Flynn's innocence, but Sister Aloysius's belief that he has behaved inappropriately with Donald is unshakable. Sister James later asks Father Flynn about the shirt she saw him leaving in Donald's locker, having not revealed this detail to Sister Aloysius. They discuss his relationship with the boy. Father Flynn offers a reasonable explanation for the situation and Sister James's doubts are assuaged. Sister Aloysius meets with Donald Miller's mother regarding her suspicions. Mrs. Miller (Viola Davis) shocks Sister Aloysius with her disinterest in the alleged misconduct on Father Flynn's part. As far as she is concerned Donald need only last to the end of the school year, as graduation from a prestigious church school would increase his chances of going to a decent high school. It is hinted that Donald is homosexual and revealed that his father is physically abusive, with the implication that one causes the other. Mrs. Miller begs that Sister Aloysius drop the matter, feeling that Father Flynn is a source of inspiration to Donald and a shield from the abuse he receives at home. She becomes angry when Sister Aloysius refuses to compromise and threatens to throw Donald out of the school. Mrs. Miller believes that Donald would be punished for something he was not even the cause of. Despite having no evidence and no support from anyone, Sister Aloysius again confronts Father Flynn and demands that he tell her the truth; otherwise, she will go to the Bishop. Father Flynn is adamant that there is no illicit relationship, but Sister Aloysius has learned that he has a history of problems, having moved between three different parishes in the last five years. She tells him that she has contacted a nun from one of his prior churches (she refuses to say whom), who corroborated her suspicions. Father Flynn is furious that she has contacted a nun rather than the church's pastor, which is proper church protocol. Sister Aloysius tells him he doesn't deserve to wear the collar, and asks for his resignation. Unable to stand up to her determination to ruin his reputation, he succumbs to her demands. Following his final sermon, Father Flynn steps down from the pulpit and shakes hands with the members of the congregation. Some time later, Sisters Aloysius and James are sitting together in the church garden. Sister Aloysius tells Sister James that although Father Flynn resigned, the bishop has appointed him to pastor at a larger church and its parochial school, in essence promoting him to a more prestigious position. She then admits she lied about speaking to a nun at Father Flynn's former church, and thus drove him out with nothing more than her suspicions; her justification is that if Father Flynn truly were innocent, he would not have given in. Repeating a line from earlier in the film, Sister Aloysius says that "in the pursuit of wrongdoing, one steps away from God." Sister Aloysius concludes that one also pays a price in pursuing wrongdoing. She breaks down in tears and says to Sister James: "I have doubts...I have such doubts." Its so easy for someone who don't know Father Flyn personally to doubt him judging on how he lived his life.It just so happened that he is so determine to keep his goodwork to himself even if it means he will be tied to such accusations.He is doing things out of the goodness of his heart.I so loved Mery Streep that she makes me laugh,horrified and amazed.The movie pretty much said it all.Doubts can be as powerful as we think but be careful not to overuse it.It might destroy you when it's overdone. For those who are being doubted upon,there shouldn't be no worries at all because if you're doing the right thing then there's no fear in being exposed.It's true specially now a days that children are being sexually abuse even by priest considering their vow of celibacy,they sometimes took their sakristans as their outlet. But our Father in heaven knows it all,if incase we are victimize by such rash judgement,then no worries again because God can testify for us.He sees us straight from the heart. I love Mery Streep in her role as a principal.She was always powerful and convincing in her role as a principal.She also got a UK accent considering she's native American and yet she can speak the british accent perfectly.I noticed though that she's done a few English films.No wonder they love her always to lead British films despite her being an American because she's impressive and no one can ever fill her shoes as an actress! She's just one and unique and no one can ever take her place.